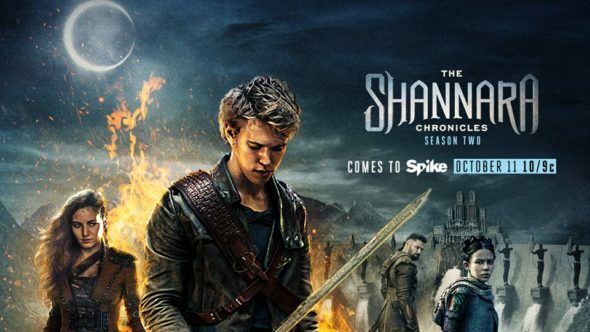 Although there was some worry The Shannara Chronicles TV show would be cancelled by MTV, it was eventually renewed for a second season. Parent company Viacom then began shuffling programs between its stations (including BET, CMT, TV Land, VH1, and MTV) and announced Shannara was moving to Spike, which would rebrand as Paramount Network in the coming year. Whether the audience will follow all these twists and turns remains to be seen. Will The Shannara Chronicles be cancelled or renewed for season three? Stay tuned. A fantasy drama based on the Terry Brooks book series, The Shannara Chronicles stars Austin Butler, Ivana Baquero, Manu Bennett, Aaron Jakubenko, Marcus Vanco, Vanessa Morgan, Malese Jow, Gentry White, Caroline Chikezie, and Desmond Chiam. When season two kicks off on Spike, chaos has overtaken the Four Lands. With the population afraid of the return of magic, a body called The Crimson does not hesitate to intimidate anyone as it hunts down magic users. Meanwhile, in the wake of his losses, Wil (Butler) forsakes his destiny, to become a healer. However, after the mysterious Mareth (Jow) saves him, he returns to the struggle. **Update below. For comparisons: The first season of The Shannara Chronicles on MTV averaged a 0.40 rating in the 18-49 year old demographic and a total audience of 889,000 viewers. What do you think? Do you like The Shannarra Chronicles TV series? Should it be cancelled or renewed for season three on Spike/Paramount Network. ** 1/17 update: Paramount Network has cancelled The Shannara Chronicles, but the producer will shop season three to other outlets. Details here. My whole family is hooked on this show. Please bring a season 3. I absolutely love this show! I hope that it doesn’t end on a cliff hanger if there won’t be anymore seasons. I don’t think enough people know that it has moved from mtv to spike though. Hoping for season 3!! Also I believe if Netflix would pick this up it would do a whole lot better! Hoping for a return Netflix had it on the most watched list and drug me into it! Please don’t cancel the show. I’m in the over 50 demographic and will follow the Shannara Chronicles a 3rd season to whatever channel it is put on. Have not watched Spike in a few years but this brought me back. The show may not follow the book but it is great in its own right. Bring on season 3! Please renew for season 3! Seasons 1 and 2 are amazing. I must know what happens next. This show and actors must continue plz.